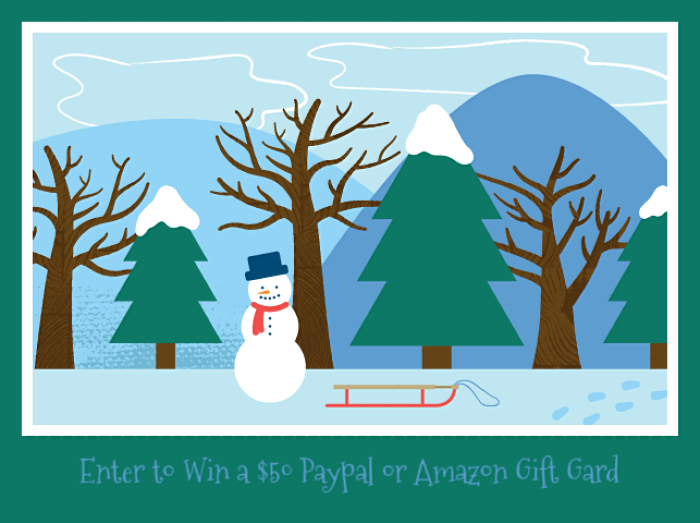 1 winner will receive $50 Paypal or Amazon Gift Card! I want to buy a Yonanas dessert maker for my husband for Christmas. If I win I will use it toward new jackets for my sons. I would buy gifts for my kids! I need a pair of binoculars…and maybe a set of silverware. We would visit our local bookstore for a shopping trip with our kids ! I would buy gifts for my family Thanks! I would buy my husband a really nice christmas gift! he has worked so hard this year, and deserves something special! I would put it toward Christmas gifts that I still need to get. Thank you so much! I would finish Christmas shopping with it. I’d put it towards new shoes. I would buy a bike for my son! I would purchase a pair of winter boots. i would buy Christmas gifts. i still need a few things. It would go toward Christmas gifts for my granddaughter. Cat and dog food for my babies. I would put it towards an X Box game for my son. I would buy my son the Golden Snitch from Harry Potter. If I were to win, I think I would go the paypal route. And then save if for January and take my mom out for her birthday. I would buy a Christmas present for my daughter! I would purchase my household necessities. I would use it for a new wallet for my boyfriend. I would buy some gifts for my family. I would use it for books and Christmas gifts. I would buy Christmas gifts for my grandkids. Thanks. I would buy the car seat covers my daughter wants for christmas. I would buy Mario Party for the Nintendo Switch. Thanks for the chance! I’d probably use it for parts for my hubby’s truck. I will get my granddaughters some books. I would put It towards Christmas presents for my grandchildren!! Thank you for this awesome giveaway!! I would purchase a MorfBoard for my son. If I won, I’m sure I would buy something for my sons. I would get a lighted makeup mirror. I’d buy a fruit gift basket for my daughter for Christmas. I would buy an Instant Pot. I would use it buy Christmas gifts for family and friends. I will get some books for my granddaughters for Christmas. I would buy my nephew a Christmas present with it. I would buy an Amazon Fire TV stick and a lady gnome statue. I would use it towards a Christmas gift or stocking stuffers. Only a few more to buy! 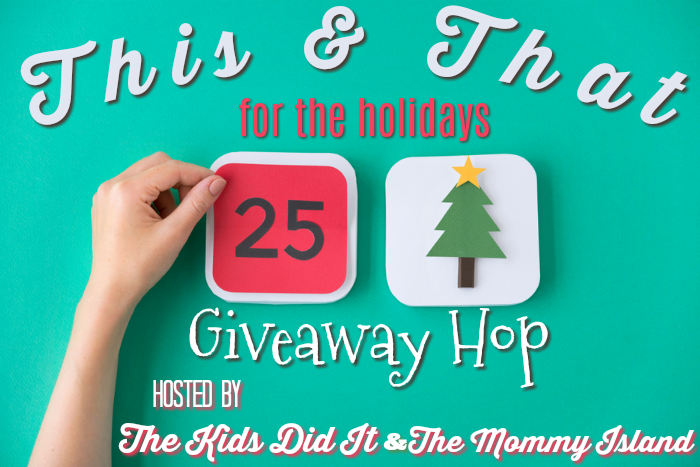 If I won, I would use it towards Christmas gifts for my daughter! I’d buy some new tree ornaments. I always like to add some new ones each year. would buy gifts for my family. I would buy gifts for my family. I have a huge wishlist lol but my daughter has some makeup that she got in an Ipsy box awhile back that also sells on Amazon, so I would get her that as she ran out of her favorite stuff. I’m saving up to get a Nintendo Switch. I would buy some memory cards and a tripod for my camera. I would purchase a couple of Christmas presents. I’d purchase some Christmas book gifts. I would buy some boots for my daughter for Christmas if I won. I would use the gift card towards groceries for Christmas Dinner. It would be used for Christmas gifts. I am looking to buy on Amazon some items to make sugar scrubs for my co workers for Christmas. This is what I would use it for if I won. Thank you. I’d put it towards the camera i’ve had my eye on. I would spend it on Christmas gifts for my grand-daughter. I would use it towards purchasing a Kindle for my son! I’m building my mother a new pc so it would go towards that. I’m not really sure, but I may actually use it to get a climbing/playing/toy thing for our cats…or give it to my sweet hubby to buy something he wants. Thanks and God bless! I would purchase toys for my dog probably, he loves toys! I would purchase food for my cats. I would purchase a bluetooth speaker. I would buy a present for my brother Miles, his birthday is Dec. 17. I would buy some candles and Christmas gifts for the family. I would buy Christmas gifts for my kids. Thanks for the chance! A birthday gift for my granddaughter. I would use it to be buying gifts. I would probably get something for my little girl for Christmas. I would get my daughter a game that is on her wish list. If I win I will use this gift card for Christmas shopping. I am doing almost all my holiday shopping on Amazon this year. Thank you for the chance to win. I’d buy cat food and dog food. I would use it toward Christmas presents. I would just save it up! For something bigger! I would definitely use this to buy Christmas gifts! I would put money for Christmas gifts. there are several things on the wish list, spoon ring for daughter and mermaid stuff for granddaughter. I would use it to start shopping for Christmas! Love the ease of shopping on Amazon. I’m saving up to either fix or for a secondhand laptop. I’d purchase a peppa pig scooter for my daughter! Buy my wife something nice. I would buy my husband some new swim goggles. He keeps losing his. I’d get some My Pretty Pony items for my granddaughter for Christmas. I’d get some new bedding. I would get a new cardigan sweater. I would buy some stocking stuffers for my children. I would put it toward some new work boots and dress shoes for my hubby for work! Some toys for my boy for Christmas. I would buy some books for my grandsons if I am lucky enough to win! I would buy some chocolates for my Aunt Martha. I would snag my hubby some new boots for work. I would buy Christmas gifts or a warm sweater for me. I would buy my Christmas tree. What would I buy if I were to win? Well, I honestly do not know. Perhaps I would put it towards an instapot? I would be totally selfish and purchase a few movies that I have in my wish list! I would purchase my daughter a camera. I want wick oil lamps & lamp oil. 7 days without electricity was rough in fl this year. I would purchase books for my granddaughter – she loves to read! I would buy Christmas gifts for my children. I would give it to my daughter who just moved to a new home. I would use the money to get more supplies for the kittens i foster. I would buy some new clothes for winter. I would purchase a special gift for my daughter! I’m going cheap this year for Christmas, so this would cover at least two gifts. I would get winter boots for my kids. i would chose the paypal money because i already have some cash there,and i’m saving for a very needed PC upgrade. I would buy the new 10th anniversary Twilight DVD’s. Would use it toward christmas gifts. My Grandson just gave me is list of books ( 13) and this would sure help me to get his list. I would put it towards baby toys for Christmas. I’d purchase a new bathroom scale. Something nice for my son and husband for Christmas! I would pay my gas bill. I would use the money for holiday gifts for the family. I would use it toward my son’s Christmas gifts. I always use my Paypal account to buy gas and groceries with my Paypal debit card. I would put it in on Christmas gifts. I would purchase Christmas gifts for my daughters. I would use it for prime grocery. I would use it for my kids christmas! I would pick Amazon and I would get a Roku Stick. I would get my oldest daughter a pair of Vans. Thank you! I’d buy some books and art supplies for Christmas presents. I’d probably buy something for my daughter with it if I won. With the Amazon gift card, I’d get some Christmas presents for friends. If I were to win I would buy some new books that I will need for college courses next semester! I will pass this on to my daughter. She just starting teaching 1st grade & is in need of supplies. I would use this for buying ingredients for Thanksgiving dinner! If I won, I’d buy lots of toys for my granddaughter. I would buy a Christmas gift for my husband. I would get myself some wireless headphones for christmas. I would buy something for my granddaughter for her Christmas present. She loves Barbie’s and other dolls. She also LOVES LOL dolls…haha, Happy Holidays everyone! I would most likely be an adult & spend it on Christmas gifts LOL! A christmas gift for my little niece! I would put it towards a coffee pot, I’m afraid mine won’t last much longer. My son wants a video recorder so I have been saving up for it. New grandbaby due soon, so I’d buy baby supplies. I would use it towards Christmas gifts for my kids. Thanks. I would like to get a few things for the holidays! I would buy my grandsons more Christmas presents! I would get some picture books for my children. A cozy new set of microfiber sheets for my bed to keep warm this winter is what I’d buy from Amazon! I would take the paypal and pay for something I already bought. Lol. Pay down bills. No, but really would like a new heavey winter coat. I would use it to get a Christmas present for my son. If I was blessed enough I would for sure spend it on Christmas. There are a couple things on amazon my son wants! Food for our holiday dinner. I would use the money to purchase Christmas gifts. I would buy Christmas presents for my children. I would buy some presents! I will use it to buy Christmas presents. I would like to put this towards Christmas gifts for my kiddos! Thanks for the chance. Christmas gifts and a book I’ve been wanting. I would use it to buy some toys for my puppy for Christmas. I would love to be able to use this towards my Christmas Shopping! I would save this towards our Disney trip! pobably just bank it for now..damn dentist! I would use it towards a new deep fryer. Paw Patrol toys for the kids! If I win, I will use it to purchase Christmas Gifts. I would use this for stocking stuffers I think. Thanks! I would use the gc towards Christmas gifts or decorations if I were to win. I would use it toward my Christmas shopping. I would get Christmas gifts with it. Christmas gifts for my boys! I would get Christmas presents for my daughter. I would purchase my hubby a pair of jeans and a sweater for me. We need them both for cold weather. We have a long list of things that need to be repaired and replaced. I’d use it to go toward that stuff. I would use it on gifts! I would buy some stuff for my kids for Christmas. I would use this on Christmas gifts for my boyfriend and our kids. I’d buy a new winter sweater. Spiderman PS4 for hubby’s christmas! I would put it towards Christmas gifts from Amazon. I need a new wireless mouse, which would be a great Christmas present for myself! Thanks for the super giveaway opportunity. I would use it towards purchasing Christmas gifts. Thank you for the chance to win! I would buy books to give as gifts (it’s a tradition we have). My nephew has a lot of webkinz on his christmas wishlist. It would go towards a dollhouse. I would buy a Christmas outfit for my granddaughter. I would buy an electric blanket. I would love to buy a new handbag 🙂 thanks a lot! As much as I would want it to be only for me.. perhaps a new pair of shoes. It most likely would go towards my childrens presents for the holiday. I would buy more canned & dry cat food. If I won, I’d buy gifts for my kids for Christmas! I would buy stocking stuffers, a nice amount for that. I would buy a video game for our son for Christmas. Thanks for the chance! i would probably just use it for my girls wishlist for the holidays! I would love to buy some books for Christmas presents! I would start my Christmas shopping and buy a gift for my grandson. I would get a lego advent calendar! I would love to get new shoes for work! I’ll use this gift card to buy some Christmas gifts for my family. I would use this prize to get my boy the slime kit that he wants for xmas! I would put it towards a security camera. i would purchase a steam mop. I think I would use it for a present for my wife. Not sure what at this time. I would buy new sneakers for work. I would use it to purchase gifts for Christmas for my nephew. I would get things for the house! I would purchase a gift for my son. I would purchase some electronics. I would love to get a new coffee machine. I would buy flannel sheets for my bed. I would use it to buy my dog’s CBD oil. I would spend it on dog food & toys for them. I will get my four- legged furbaby a new bed. My furr baby needs a new bed. My youngest daughter will be moving to a new apartment the end of the year. I think I’d use this to get her something she needs at the new place. I think I would use it for some Christmas shopping. I would put the money towards a camera for my son. I would buy my son a lego set for Christmas. I would love to use it to buy my daughter a new pair of snow boots for the winter ahead! I would buy a Garmin forerunner 35 running watch. I would buy pillows for my daughter’s new, first bed. I would use this towatds a Sunny Day toy my granddaughter wants really bad. I would use it to get my daughter Christmas presents. I would purchase a Lego City set for my grandson this Christmas! I would start my Christmas shopping if I won, I would buy my granddaughter a nightgown. I would buy gifts for my son and nephew for Christmas. i would buy holiday gifts for my family. I would purchase stocking stuffers! I’d put it toward Christmas gifts. I would use this on gifts for my kids! I would use it to pay “Santa” for the gifts under the tree this year!